Chris Clare uses it to manage his trade partners; Stephen Myers to track cycle time on his specs and presales. Pat Woods and Steve Shoemaker use it to boost buyer satisfaction and inspire referrals, while Geoff Bellchambers relies on it to improve construction quality and Joe Murphy to control costs. The “it” is data, and it is poised to replace guesswork and gut instinct as the way business is done and decisions are made in successful home building companies. True, every builder has some data about some thing, probably in the form of a spreadsheet or two, numbers on a screen that may give a hint to what’s really going on, but often just that. A shallow view, likely incomplete and often unreliable. To be truly data-driven—that is, to make strategic decisions based on clean, comprehensive, and objective information—requires a mindset and a dedication of resources, some of which may be new. “It requires a true team approach, a sincere investment, and a commitment to best practices if it is going to be effective,” says Dan Arnold, managing partner at Trifecta Research, in Asheville, N.C. But to date, most builders lack or are unwilling to make that commitment. Why? Tradition. Inertia. Ego. Money. Distrust of the digital age. Having your head down on the daily grind instead of lifting it to get a broader view. Take your pick. Whatever the reason, this much is true: Data provide a no-doubt, proven ally to achieving greater efficiency, productivity, and profitability in every major industry ... except housing. But more so than the “why,” it’s the “how” of data that seems to flummox builders. Gathering, distilling, analyzing, and leveraging data can not only be baffling and overwhelming to data neophytes, but also viewed as a cost with an uncertain return, a risky venture in a risk-averse culture. Better, it seems, to continue relying on past experience, gut instinct, the same meetings and trainings, and perhaps browbeating subs or subordinates to ease pinch points—all with middling and unmeasured success. And it doesn’t have to be an operations-wide solution, at least not out of the gate. To keep it manageable, data-driven builders typically use facts to attack their most pressing challenges first, ones that every builder recognizes and confronts. DSLD Homes is a big fish in a relatively small pond, closing more than 2,400 detached units a year in its home state of Louisiana and select markets in Mississippi, Alabama, and the Florida Panhandle. It would stand to reason the company would have its pick of the local construction trade base, providing enough steady work to keep the best of the best busy, and with the leverage to hold labor costs in check. And yet, that enviable status wasn’t enough for DSLD. Unhappy with inconsistencies in construction performance among its trade partners, the builder initiated a reporting protocol that would ideally provide an objective and consistent snapshot of what was going on in the field. So Clare created a digital platform and modified an existing software program to get “clean” (reliable, comprehensive) data, specifically programming a checklist mirroring DSLD’s field guides for the iPad that automatically syncs with a database maintained by an in-house IT team. Site superintendents now complete and submit digital checklists of multiple items specific to tasks (e.g., rough framing) for each house they manage as those tasks are performed and evaluated. If a task is incomplete or substandard, the app opens an email from the super to the sub to get on it; when finished to the super’s satisfaction, a completed and submitted checklist triggers payment through DSLD’s purchase order system. “Tying the checklist to pay points was critical in getting this level of information,” says Clare. He’s also solicited feedback from supers and subs to amend the checklists and field guides to get even better data. Clare and other managers now generate on-demand reports that provide a snapshot of the status of each active sub working on every DSLD house under construction across four states and multiple communities, identifying trends and issues to address at the micro and macro level. In short order, he can see if a site is ready for the next trade and whether the jobsite meets standards for cleanliness, waste removal, and recycling. It’s also geared to verify material delivery specs from vendors, flooring and trim tolerances, and plumbing functionality, among hundreds of metrics broken down and more easily managed within the broader tasks. And because the host software program was already integrated into DSLD’s back office, it didn’t need a different iPad app to engage, making it easier for the field to follow through. Case in point: DSLD fired three vendors in one month because they failed to get better despite an objective track record of poor performance. “We warned them there would be consequences if they didn’t improve,” Clare explains. They made no measurable effort, he says, and were summarily dismissed—a decision based on facts, not feelings. The system isn’t just punitive. After digging into why a favored plumbing sub was suddenly underperforming in a particular community, DSLD set up a satellite office to get him and his crews physically closer to that jobsite. “It was a matter of logistics, so we made it easier for him,” says Clare. After that, the sub’s scores climbed back up. And the data aren’t siloed in production. DSLD’s new warranty program (inspired by the online scheduling interface used by the COO’s dentist) shares the same platform and database as the QC program, allowing managers to cross-reference production fails and warranty service calls. “Open items at closing are one of the big issues that bring down customer satisfaction scores, so we will be able to pinpoint those issues going forward,” Clare notes. Myers appreciates the ah-ha moments when his colleagues at Thrive Home Builders confront the reality of data-driven decision-making. “It’s great fun to have a well-rooted preconceived notion, peer into the data, and have it tell you the complete opposite of what you thought,” he says. “It happens so often it has become a source of humility and true entertainment value.” It’s also becoming a new reality at Thrive, with Myers’ ultimate goal to leverage data as a strategic tool across the company. His first foray into countering (or confirming) long-held assumptions was to dig deep into the builder’s cycle time and profit margin, specifically differences in those respects between the builder’s presales and spec homes. “The conventional wisdom is that a spec home will go faster because it doesn’t have a pesky buyer attached to slow things down and muck up your profit margin,” he says. But once Myers put an objective eye to it, the exact opposite proved true; in most cases, he says, the data showed that spec homes were much slower to market than presales. The root cause is open to speculation and deeper investigation, he says, but is less material than the simple and objective fact that Thrive’s specs took longer to build. His research, culled and combined from existing if not entirely integrated in-house data sources, also revealed that specs were less profitable than presales. “Once they were finished, they were often discounted to move off the books as quickly as possible,” says Myers, and usually with an additional incentive if placed on a less-than-stellar lot or competing against newer product. At Thrive, a dedication to data emerged from the company’s open-book management culture, which uses financial metrics (i.e., data) to inform, update, and hold employees at all levels accountable for that aspect of the company’s performance. “It tells a story about where the issues are,” says Myers, a lesson he then applied to production. To get real about specs and presales, Myers started with the clean data he had on hand—accurate sales dates per each presale contract; accurate start and closing dates from production and sales, respectively; and which homes were being built and sold on which lots in which communities. Thrive’s wish list derived from recognizing it did not have a good line of sight into the interim milestones between starts and closings, a gap the company solved by integrating digital, in-field systems and software to more precisely track its trade and supply partners along the production path. Data provide a no-doubt, proven ally to achieving greater efficiency, productivity, and profitability in every major industry ... except housing. Similar to Clare, Myers tied Thrive’s scheduling system to purchase order approvals to spur more timely reporting, and he found a program that automates the bulk of the data entry. “Now we have a stream of high-quality data that means something and tells a story,” he says. When Geoff Bellchambers joined Toll Brothers as its corporate vice president of quality assurance two years ago, he not only came with a data-driven mindset, but found himself in a like-minded organization. “Every aspect of the company collects and uses data for decision-making,” he says. Having cut his teeth in similar roles at KB Home and PulteGroup and a stint developing quality certification programs for builders and trade contractors at what is now the Home Innovation Research Labs, Bellchambers’ first step was to determine what in-field data would be most valuable to collect. “You have to find out what you can measure from what you’re doing [in the field] to objectively gauge performance and identify opportunities to improve,” he says. Scrutinizing every step along the production path, from complex assemblies to individual components, Bellchambers and his QA team, along with input from Toll’s construction managers, trade partners, and Cottrell’s team at IBACOS, updated “Toll Technical Standards” and compiled a guidebook and library of detailed illustrations showing proper practices for how the nation’s fourth-largest builder constructs more than 8,000 homes a year across multiple markets. He then leveraged the illustrated standards into a digital platform, a checklist of sorts, and equipped the field with mobile devices to ease data entry and automatically send inputs to a central database with online dashboard visibility corporate-wide. “The speed and ease of collection, the accuracy of objective data, and then turning that data around into usable information is extremely valuable,” he says. With that foundation established, Bellchambers upped the ante by asking IBACOS to augment its suite of digital performance assessment tools to include inspections at the individual lot level, giving Toll the ability to monitor construction quality more closely for continuous improvement in performance and cycle time. That level of detail, he says, enables him and others at Toll, including his counterparts in design, purchasing, construction operations, and warranty services, to get a complete and objective picture of in-field activities, including subs and suppliers, from a single home to a community, market, division, and corporate level. “It not only allows us to identify specific issues and take immediate action, but also broader patterns that will help us get better across the company,” he says. The concept of customer satisfaction in home buying has evolved quickly in the last decade or so, from simple exit surveys to tracking multiple touch points along the entire sales and service experience. But the end goal is almost always the same: To boost word-of-mouth referrals, whether at dinner parties or, increasingly, through social media. Or, as Pat Woods calls them, “recommenders.” “We want to know what our buyers think about their experience with us so we can improve and earn their recommendation,” says the senior vice president at Desert View Homes, in El Paso, Texas, a division of View Homes, a developer-builder operating in multiple Southwestern states. At Ideal Homes, in Norman, Okla., a full third of the company’s 345 closings in 2017 came from referrals, and nearly 40 percent from online leads or web-initiated inquiries. “You can imagine the implications of the customer experience and satisfaction on our $80 million business,” says Steve Shoemaker, Ideal’s vice president of sales and marketing. To help see and improve their respective CS/CX efforts, ideally resulting in more referrals, both builders use Avid Ratings to survey homebuyers 30 days after closing and 11 months later—a stream of data that helps recognize deficiencies and successes. “We call people who give us negative comments and low scores to try to make them right, and also those who gave us high scores to find out what we did right,” Woods says. Results from both types of outreach are passed along within Desert View Homes and shared with other divisions. The data are valuable both statistically and anecdotally. “It’s a good snapshot of how we’re doing and where we need to improve in all aspects of the business,” says Woods, as well as providing insight into buyer preferences that inform adjustments or new product development, down to a micro level. In El Paso, for instance, homebuyer survey data revealed a strong preference in lower price points for a high-gloss interior paint finish throughout the home, not just in kitchens and baths, to more easily clean the walls. “We made that change only in certain communities in El Paso,” Woods says, thus rifle-shooting a spec to satisfy a small slice of buyers without dissatisfying others. In addition to enabling in-house improvements that, in turn, help drive greater customer satisfaction and referrals, Shoemaker also shares the data with a steering committee of Ideal’s largest trade partners. “It validates their work, holds them accountable with facts, and creates a positive tension and competition to improve,” he says. You know the cost of the materials and labor that go into your homes—or should. Hard costs can account for about 55 percent of a home’s overall cost, by far the most of any cost associated with new-home construction, regardless of volume, market, or price point. And it’s no secret that those costs contain a fair share of waste. But what about the “should” cost of labor and materials? That’s a different animal, one that Joe Murphy, PulteGroup’s vice president of procurement, relies on data to continually benchmark, track, refine, and negotiate with the suppliers and trades on the 21,000-plus homes the Atlanta-based builder closed in 2017. Simply, the “should” cost is an amalgam and analysis of several data points that allow PulteGroup’s procurement team to present objective, factual cost information to subs and suppliers during contract negotiations. Leveraging multiple data sources, including a wealth of in-house historical knowledge, Murphy and his team enter contracts with a strong assurance their costs are accurate, lean, and fair. While the methodology is foundational, the numbers obviously change depending on the market, product, and community; the “should” costs for a PulteGroup townhouse project in Ponte Vedra, Fla., priced in the $290s, are different than for a detached-home community in Las Vegas selling in the $800s. Murphy and his counterparts at the division level work in concert to seek out relevant data and build and enhance reports that help them evaluate bids, assess new trade and supplier partnerships, and gain a clearer line of sight to big influences and trends that might change the game or influence the numbers. “The speed with which we can react to situations and changes in the market exceeds what we could do before we took this approach,” Murphy says. It also breaks down barriers with the builder’s supply chain partners and turnkey trades to collaborate and share information, which leads to additional cost and production efficiencies. “We know there is tremendous waste in our industry, and if we can use data to prove that to a trade partner, it starts a conversation to get to the root cause,” Murphy says, no matter if the responsibility ultimately lands on the trade or the builder, and usually both to some degree. Kristi Saathoff listens to refrigerators. As the senior director of the Zoneline Business at GE Appliances, part of her job is to evaluate data collected from the company’s internet-connected appliances and glean opportunities to improve the ownership experience and GE’s service response among consumers. For all the pop-culture talk about “smart” refrigerators that scan your food, sense when it’s going bad, suggest recipes, and build shopping lists, the data Saathoff collects from that hulking appliance is arguably more valuable to both consumers and certainly her company, and perhaps builders, too. Simply, for appliances that are internet-enabled and securely connected to the web at each homeowner’s discretion, Saathoff and her team can monitor their performance remotely. Leave the freezer door ajar? Look for a text alerting you to check it. Filter about to expire? Get a push notification through the app, along with the exact spec and nearby suppliers and contractors. Saathoff also leverages user experience and performance data to improve the company’s products. 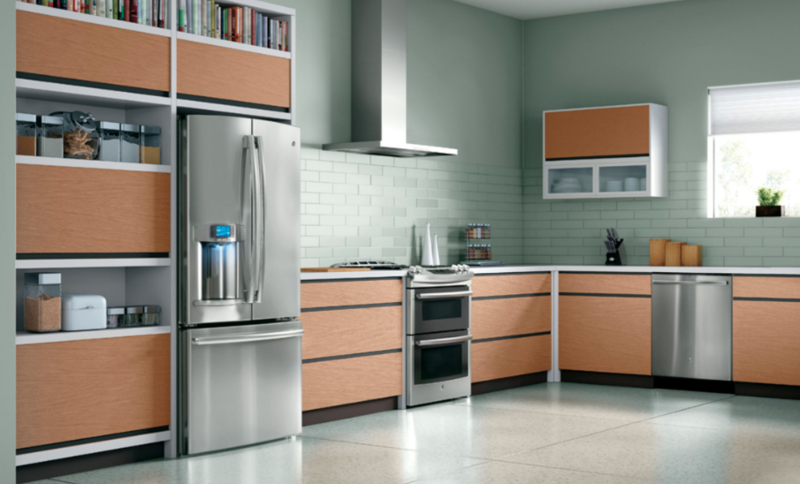 Case in point: After collective data showed that right-side doors of GE’s French-door and side-by-side refrigerators were opened far more often than the left, the company changed its testing protocol and engineered the right-side door to survive the extra workload. “The new protocol better resembles what actually happens in a home,” she says. So far, builders mostly have been left out of the loop, primarily because the homeowners opt-in to connect the appliances after occupancy and enter a digital relationship with the manufacturer, not the builder. This story originally appeared in the April 2019 issue of Professional Builder magazine. See the print version of this article here. Rich Binsacca is Professional Builder’s editor-in-chief. He has served as an editor and frequent contributor to several housing and building construction-related print and online publications, and has reported and written about all aspects of the industry since 1987.